Egg fried rice (Gyeran Bokkeumbap, 계란볶음밥) is a simple stir fried dish mainly using egg and rice. As many of you know, rice is a Korean staple food. Most Koreans would eat rice for breakfast, lunch and dinner. So it’s not uncommon to see people making some quick fried rice from early morning for breakfast. 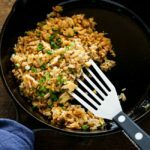 I named this recipe “Breakfast Egg Fried Rice” because it is simple enough that you can even make it on a busy morning. 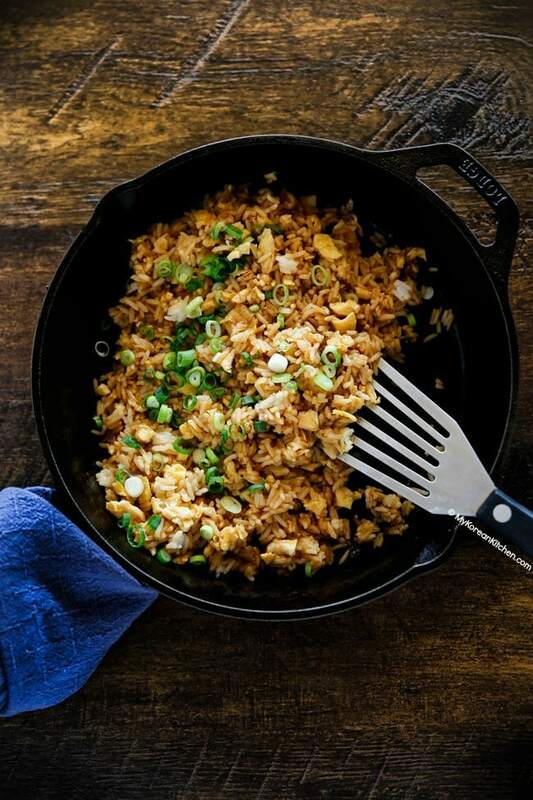 Is Breakfast Egg Fried Rice Only for Breakfast? You can certainly make it for brunch, lunch or dinner, or whatever occasions might call you. 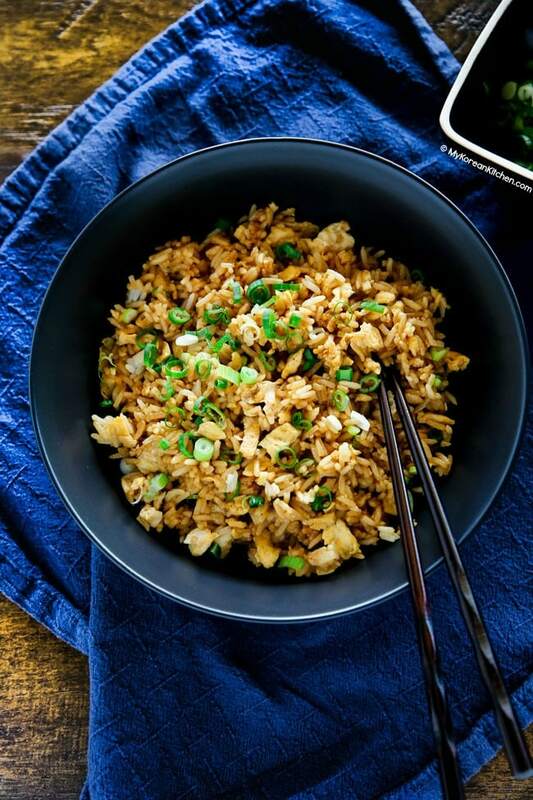 But if I were to make it for other times of the day, I would add more protein and vegetables to substantiate the volume of fried rice and for more complex flavor and texture. See below for the variation tips. Essentially, you can add whatever suits your style. However, below seems to be the most popular choices for many Koreans. 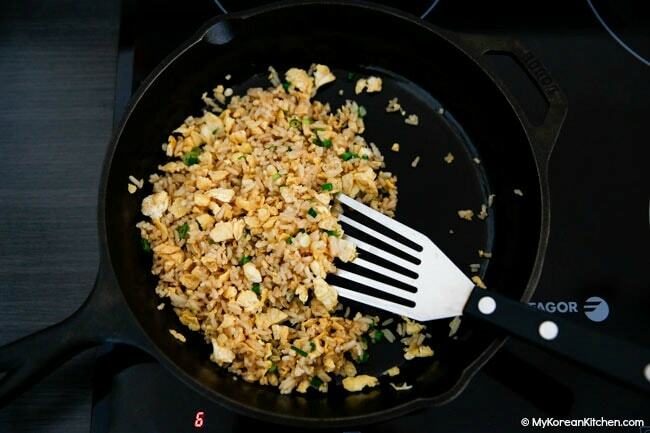 The most common seasoning for fried rice is salt and soy sauce. Some people use oyster sauce too, which is great for adding depth of flavor. But for me, I like something that’s simple and quick, particularly for breakfast. So I mainly use soy sauce. But if you want to see some oyster sauce in action, check my Easy Fried Rice with Bacon recipe. The best rice for fried rice would be slightly drier rice, which happens to be a day old. It also makes sense to use day-old rice from a time saving perspective in the busy morning. That being said, I often make fried rice with freshly cooked rice (in my rice cooker) too. I just cook it with slightly less water to make the rice drier. Once this rice is stirred and cooled down for 10 – 20 mins, it should be good to go for stir-frying. As I mentioned briefly above, have some cooked rice ready in your fridge or freezer. If it’s from the freezer, thaw it either overnight in the fridge or microwave it until moderately defrosted. 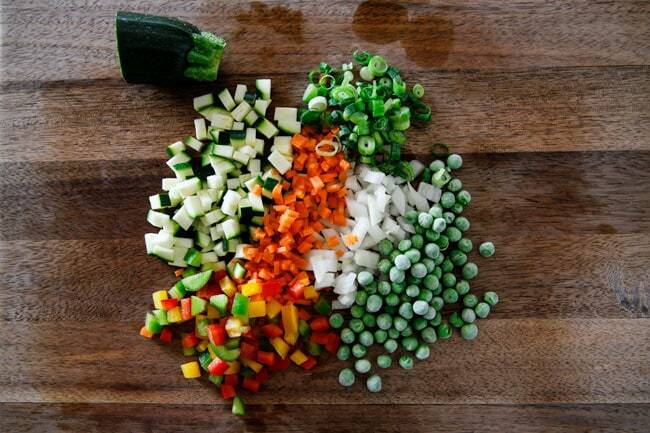 If adding, you can also prepare vegetables beforehand too. Dice and store them in an air tight container(s). Any unused portion of fried rice can be stored in the fridge for a few days. Make sure the container is air tight and you transfer the rice into the fridge soon after making it. You can reheat it in the microwave or over the stove. If using a microwave, make sure to give it a good stir during reheating to ensure the heat is evenly spread across the rice. Serve immediately when piping hot. 1. Beat the eggs in a mixing bowl. 2. Heat a skillet over medium high heat. Once heated, add some cooking oil. Reduce the heat to medium. Pour in the beaten eggs. 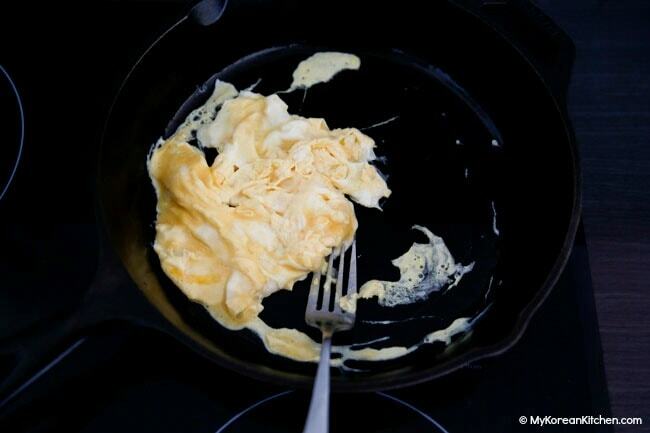 When the egg starts cooking, break the egg into smaller pieces using a fork or chopsticks. 3. Add the rice when the egg is partly (70 – 80%) cooked and stir the rice evenly. Add the soy sauce and gently mix with the rest of ingredients. (Optional) Add some sesame oil, sesame seeds and green onions then gently toss to coat. 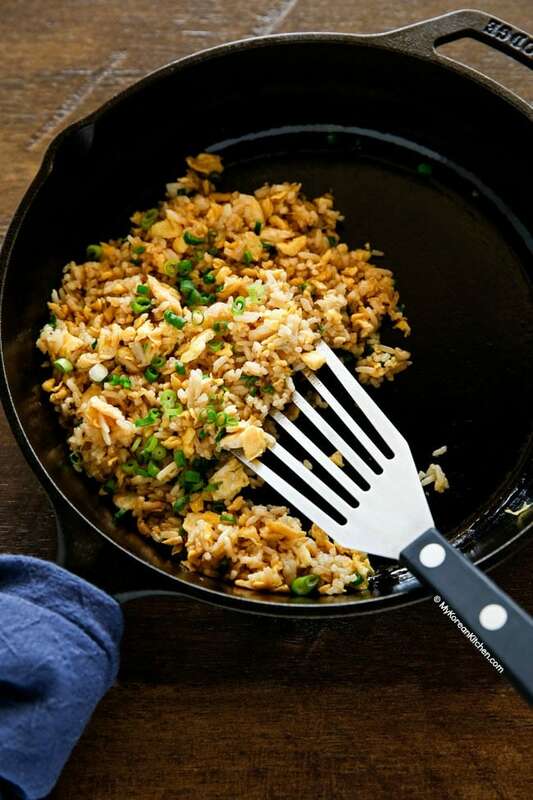 Easy egg fried rice recipe. A perfect quick breakfast! Beat the eggs in a mixing bowl. Heat a skillet over medium high heat. Once heated, add some cooking oil. Reduce the heat to medium. Pour in the beaten eggs. 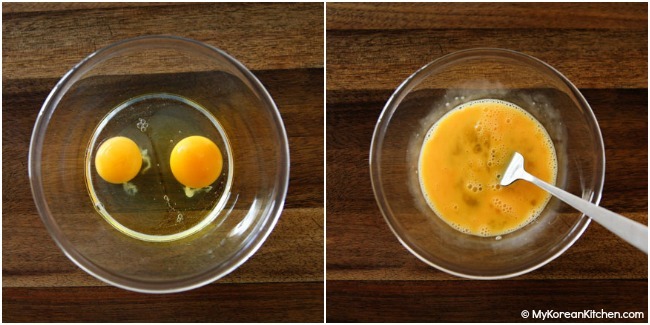 When the egg starts cooking, break the egg into smaller pieces using a fork or chopsticks. Add the rice when the egg is partly (70 – 80%) cooked and stir the rice evenly. Add the soy sauce and gently mix with the rest of ingredients. (Optional) Add some sesame oil, sesame sesame seeds and green onions then gently toss to coat. Oh my goodness this could be my breakfast, lunch and dinner! Thanks you! This is such a staple! Thank you so much for sharing. Cannot wait to make this at home. 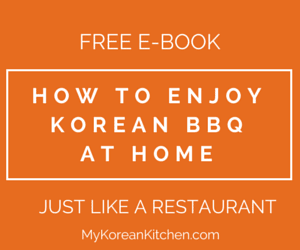 Looking forward to trying the kimchi version too! I made something like your egg fried rice yesterday. Even though I had the frozen vegetables and snow peas, I left them out and just used finely chopped white onions, green onions, diced Spam(the staple meat here in Hawaii) one egg scrambled, soy sauce(we call it shoyu), a lititle oyster sauce, freshly ground pepper and a sprinkling of Hawaiian chili pepper water. The rice was a day old. There is a rice factory here that imports quality Japanese rice and it makes for perfect fried rice. The leftovers today were great. Perfect for omurice. Excellent. I added some Cinnamon Pork Belly to this, since I had some left and it was homemade with organic Pork Belly. But I realize the trick to this recipe is the Sesame oil and the seeds. Oh my goodness does it give a nice flavor. Nice tip on the egg too. Rice is much healthier than the typical American breakfast in my opinion. Hi Shaila, My every day soy sauce is regular Kikkoman soy sauce sauce like this one (http://amzn.to/2dxEAKV). I like it because it’s naturally brewed (without any added chemicals). 🙂 I’ve been using it since 2007. Can the rice be left over rice cooked the day before? hi I love your blog. I was surfing online for some recipes. anyway, just wondering what kind of rice you use? brown rice? what/which brand? take care there. I hope to see more delicious recipes here thanks for sharing. For this recipe, I used jasmin rice. Normally, I cook with sushi rice (short grain) and brown rice. I didn’t know that people in Indonesia have this for their breakfast daily. I don’t feel lonely now. ^^ Because I got scolded by my friends and family that I am not eating healthy or not feeding my husband properly compared to Korean style breakfast like rice and a couple of side dishes. About the rice wine, they smell and taste like alcohol. 🙂 I use it to get rid of the meat smell most of the time, other times are to give a refreshing taste. And about the olive oil, I will do a post about it. There is no specific reasons, but other people might want to know. Hello! I’m from Indonesia, and since last year I’ve been staying in Singapore as international student. 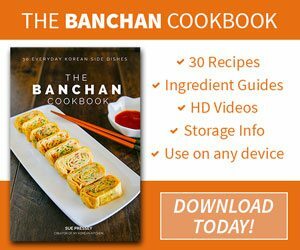 ^^ In the time that I need a cooking skill to survive, I found this website last sunday, and I think this is very amazing! I try to cook my own version of Tuna Pancake (must adjust according to our taste), and my roommates all said it’s delicious 🙂 Thanks a lot for your recipe! 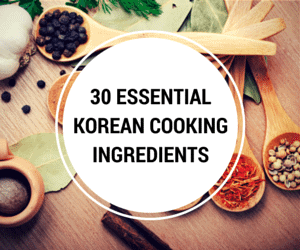 I’ll go find these ingredients and try to cook some other Korean food, hopefully it’ll be as successful as my first try. Actually this fried rice in your recipe is an everyday breakfast menu for people in Indonesia XD We add some sweet soy sauce and pepper in it. Oyster sauce also can do wonder. My mum always make one with diced canned pork meat. But we never use olive oil, why do Korean use so much olive oil instead of cooking oil? I notice a lot of them use rice wine too. These ingredients are one that I never touch before, do you have any tips for them? What do they taste like?